Chain & Drives offer industry leading Sumitomo and Transtecno Gearboxes and Drive Assemblies for high quality, long lasting performance. Motordrives Australia was formed to provide a large range of the world’s leading brands of Power Transmission products to the OEM market. 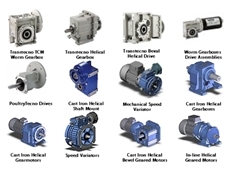 Motordrives aim to provide their customers with first class service and quality products. AC Hargreaves is a Queensland owned company in the Electric Motor Repair Industry. Their experience ranges from rewinding and repairs of AC / DC motors, alternators, transformers, pool pumps, submersible pumps, brake coils and associated equipment. 01/11/12 - Misal Technologies Pty Ltd offers a 2 kW electrical motor for Lowara electrical bore pump in a second hand condition. 17/10/12 - Misal Technologies Pty Ltd offers a Stone McCole electrical motor in good condition. 16/10/12 - Misal Technologies Pty Ltd offers an almost new MEZ electrical motor. 11/03/09 - With the NH²hydrogen powered tractor, farmers will be able to perform agricultural operations, based on the hydrogen they produce.